Green version of the Super Action Statue Star Platinum! Jotaro Kujo's Stand from JoJo's Bizarre Adventure: Part 3 Stardust Crusaders. 10-inches tall, it's decorated with metallic paint and includes an optional head and extra hands! In JoJo's Bizarre Adventure: Part 3 Stardust Crusaders, the third story arc of the series, Star Platinum is the Stand of Jotaro Kujo and is able to stop time, with an absolute limit of five seconds. 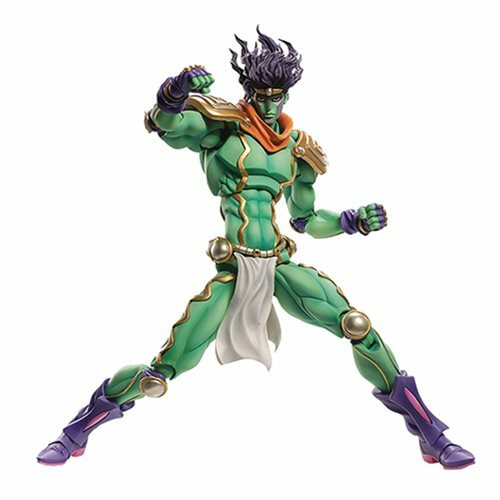 This green version of the Super Action Statue Star Platinum is especially big at 10-inches tall, comes decorated with metallic paint, and includes an optional head, several fixed-pose hands, and a figure stand to recreate your favorite combat poses. Don't miss the JoJo's Bizarre Adventure: Part 3 Star Platinum Super Action Figure! Ages 15 and up.